This stunning matching numbers example was 1st sold in January of 1936 to Richard Taylor of British Motors in NY. It next appeared in 1957, bought by Al “Bud” Lewin of Creve Coeur, Missouri, but it was Black with a Red interior then. In December of 1959, Al donated it to the National Museum of Transport, where it remained until 2000. In 2000, after 41 years on display, the museum started a restoration that was not completed due to lack of funding. The car had been stripped, and its parts stored in boxes. The museum auctioned the car off in September 2005 to Thoroughbred Motors of Sarasota, Florida, who kept it as it was until May of 2013 when it was acquired by its latest caretaker, C.S. After he purchased this rare diamond in the rough, C.S. had everything shipped to Classic European, so it could begin its full concours restoration. 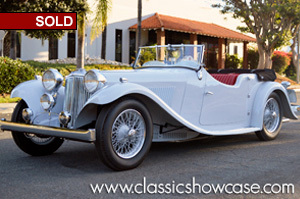 After two long years, Classic European completed the restoration in 2015. Both the owner and the restoration company worked together to make sure this example was both accurate in originality and had excellent quality in its craftsmanship. Painstaking research had been undertaken, in consultation with experts around the world, in order to validate and authenticate the originality and concours details. During this time, it was restored back to its original birth colors of Birch Grey with a Red interior, and a black top. A few of the many outstanding features of the SS-1 Tourers include the split rear seats, the luxurious rear leather armrest, the “Sunburst” interior door panels and the fully chromed wheels which are painted body color leaving only the outer rim showing the plating. It is one of seven known survivors of the seventeen tourers made at the end of 1935 that were completed with the 1936 front grille and badging. This work of art comes with a Jaguar Trust Heritage Certificate detailing its heritage, concours tools, a car cover, battery maintainer, two instruction books, copies of prior ownership registration, photos of restoration, “SS1 & SSII Cars” book by Allan Crouch, “Jaguar SS Cars 1931-1937” book, starting instructions, museum plaque, side curtains, soft top boot cover, judging sheets, copies of the CJA news and technical bulletin dated 10/17, Jaguar Tracks from October 2015, the original 1935 black plate, extra photos, one key, and the trophies it has won. A highly collectible model with providence, and detailed history, this SS1 is for the discerning collector who demands the best of the best. Ready to be shown and admired, as there are no disappointments. The Swallow SS-1 is a British sports car produced from 1932-1936. The Swallow Sidecar Company of Coventry, England began building automobiles in 1927 and introduced the Swallow SS-1 in 1931 at the London Motor Show. The SS-1 Tourer was launched in 1934. The later 1936 Tourer was designated as a “Jaguar.” According to Alan Crouch (Jaguar Heritage trust historian) and author of “SS-1 & SS11 Cars” there were a total of 544 SS-1 Tourers made between 1933 and 1935, of which only 78 are believed to survive. Because the factory was reported to have exhausted their parts supply, 17 Tourers built at the end of 1935 were modified to accept the 1936 grille and a special front enamel badge made to read “SS-1” instead of the 1936 badge reading “Jaguar”. Of these 17 unique cars, only 7 are known to remain and this car is one of the 7 survivors. Richard Taylor of British Motors of New York, the sole concessionaire for SS cars in the US offered the SS-1 Tourer for sale in 1935 at a price of $2250. After WW2, “SS Cars Ltd” changed their name to “Jaguar Cars Ltd” due to the negative connotations of the SS initials. After SS brought in the SS Jaguar (SS100 and sedan), they continued to make SS1’s for a while to use up bodies / chassis but updated the grille to match the SS Jaguar range. So, when the new ‘Jaguar’ model with OHV was introduced in 1935, for the 1936 model year, it wasn’t quite the end for the SS1. The SS1 models were given the new Jaguar grille with the “Jaguar” enamel badge insert replaced by one with “SS1”. The first of the new badges were a bit rushed having hand-made wings. As the predecessor of the Jaguars built by SS Cars Ltd in Coventry, the SS1 anticipated and sums up the future motto of the brand 'Grace, Space, Pace' (grace, space and pace) alone. The initials SS represented the Swallow Sidecar & Coachbuilding Company, which was founded in Blackpool, England, by William Walsley in 1922. The firm had embarked on the construction of automobiles in 1926, its first success being a seductive sports sedan on Austin Seven chassis. The status of car manufacturer was official in October 1931 with the launch of the SS1, a coupe. Based on that of the Standard Ensign 16 HP, the SS1 low-profile chassis was designed by Lyons and was supplied exclusively to Swallow by John Black's Standard Motor Company, which also supplied the two-and-a-half-cylinder, two-and-a-half-cylinder engine with four-speed gearboxes. Lyons' body design was striking: the SS1's long hood, tiny cockpit and helmet-shaped front fenders suggested the most unbridled performance. By its looks, the SS1 established the concept of future Jaguar, combining sporty look and technical characteristics above average, all for a price unbeatable competition. The bodywork of the SS1 was retouched for the 1933 vintage and the mechanical specifications improved with alloy cylinder heads and an optimized collector, modifications that carried the maximum speed to 120 km / h. For 1934, the SS1 received a wider track chassis and larger Standard engines of 2.143 cc and 2.663 cc, while its bodywork - now available in four different configurations - received new retouching.